Kinnelon, NJ – The Carpet and Rug Institute (CRI) and Simple Marketing Now LLC are pleased to announce the launch of The Carpet and Rug Institute Blog. The new weblog promotes online conversation about carpet and how it benefits life, health, learning and the environment. The Carpet and Rug Institute Blog will allow CRI to increase the visibility and availability of the extensive scientific research it has conducted in the interest of customer advocacy and environmental stewardship on behalf of the carpet industry. As a social media platform, the CRI Blog will also generate and manage discussion of the many topics of consumer interest, and dispel myths associated with carpet. Furthermore, readers can comment on, email, or use social bookmarking and sharing tools for individual posts. James Beach, director, market issues, and Bethany Richmond, communications manager, are the primary contributors to The Carpet and Rug Institute Blog. “This blog is a natural extension of the CRI’s communication strategy. We’re excited about taking part in the online conversation and sharing the research and data we’ve generated on the benefits of carpet,” says Beach. “The Carpet and Rug Institute Blog is an effective example of traditional marketing bridging with new and social marketing tools to ensure that our audience finds the most relevant content possible about carpet,” adds Whittemore. CRI members are encouraged to subscribe to the blog for updates via email or RSS feed, to inform their constituents about how to subscribe and also to contribute to the online conversation with topics and suggestions that relate to the blog’s mission. For more information, contact Beach at jbeach@carpet-rug.org or Richmond at brichmond@carpet-rug.org. 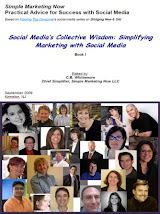 For more information about Simple Marketing Now LLC, contact chief simplifier Whittemore at CBWhittemore@SimpleMarketingNow.com or visit the Simple Marketing Now website and companion weblog & newsroom – Simple Marketing Blog. The Carpet and Rug Institute is a nonprofit trade association representing the manufacturers of more than 95 percent of all carpet made in the United States, as well as their suppliers and service providers. For more information, visit http://www.carpet-rug.org/. "Blogs are now mainstream media."